Create a memory of those warm summer days, sitting on the porch with a chilled glass of lemonade. Warm breezes gently rock a hanging basket of fuchsias in vibrant colors of violet, turquoise, grape, green and rose. Mill Hill Seed beads add texture and sparkle. 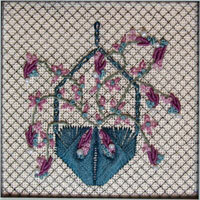 Stitches include a wonderfully creative Amadeus for the basket and free form Bullion and French Knots. Celebrate spring with these soft and delicate flower clusters in warm mauve and creamy shades of blue/green. 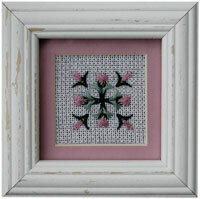 Amadeus and Rhodes Hearts are the central stitches in this delightful new design. 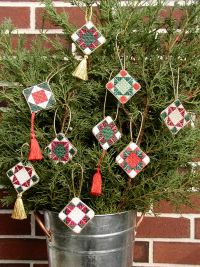 This fun and easy Christmas ornament gives lots of choices. Use any of the nine color choices in the book or use the threads in your stash. Stitches include Diagonal Mosaic, Waffle, and Gobelin. Create an elegant box of jewels in a palette of purples and blues with these luscious new fibers from Presencia in Spain and House of Embroidery threads from South Africa. Working on 18 count mono canvas, students will learn to prepare and mount canvas, use a laying tool, compensation, work with metallic threads and how to create a “mirror” stitch. An intriguing array of stitches spread across the canvas, including Wrapped Coils, Bargello, Amadeus, Crescents, Rhodes, and Jessicas. Jewelry box is also available. 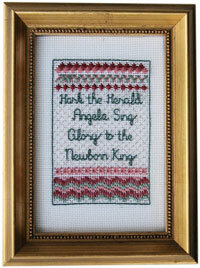 Celebration is a festive new design with lots of color and some great new stitches. Five colorways are offered including Tropical (pictured), Williamsburg (blue/rose), Autumn (rust/gold), Meadow (green/rose), and Terra Cotta (blue/peach). Finished size is approximately 8" by 12".